In the early 1980s some computer companies concentrated their efforts on the development of specialized workstations, the “graphics workstation”. Customers used graphics workstations for electronic and mechanical design because basic workstations were too slow and lacked sophisticated graphics. Several early graphics workstations were sold by Apollo and Sun. Early on the Sun 1, the Sun 2 and Sun 3 workstations came on the market. Apollo, one of the real workstation pioneers, started their workstation development in 1981 with the DN100 and later the DN550. Their workstations were widely used through the mid 80s, and Apollo, Sun, and HP each had about 20% of the workstation market when Apollo (after a short try at a joint project with Intel), produced the DN3000, the DN4000 and four-CPU DN10000 workstations (DN meant “DOMAIN Node”.) They introduced the PRISM CPU to the market. It was the first real two-instruction microprocessor and the fastest available workstation until the IBM RS/6000 series. Apollo was acquired by HP in 1989, and they merged their own Series 9000 workstation line with that of the Apollo systems. One of the most important contributions in the area of display hardware is attributed to Jim Clark of Stanford in 1982. His idea, called the Geometry Engine, was to create a collection of components in a VLSI processor that would accomplish the main operations that were required in the image synthesis pipeline: matrix transforms, clipping, and the scaling operations that provided the transformation to view space. Clark attempted to shop his design around to computer companies, and finding no takers, he and colleagues at Stanford started their own company, Silicon Graphics Inc.
Silicon Graphics Inc. (later known simply as SGI) was one of the leading manufacturers of graphics computer systems, workstations, and supercomputers. Its history may be described as an exemplary Silicon Valley success story, until lower-priced competitors and inept production methods resulted in heavy losses in the late 1990s. Silicon Graphics capitalized on pioneering technology in 3-D computer graphics to create products used in a wide variety of professions, including engineering, chemistry, and film production. 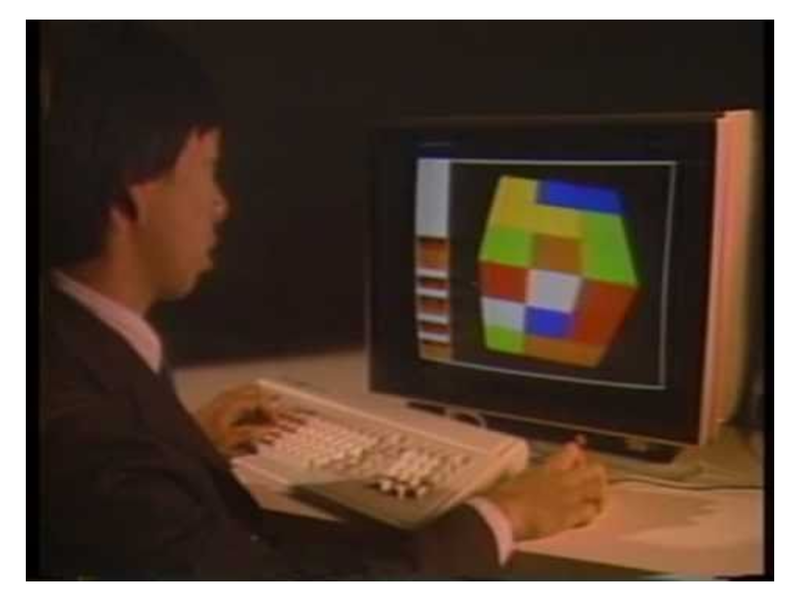 In 1983 the company released its first products: the IRIS (Integrated Raster Imaging System) 1000 graphics terminal and an accompanying software interface known as the IRIS Graphics Library. It used the 8MHz M68000 processor with up to 2 MB memory, a custom 1024×1024 frame buffer, and the Geometry Engine gave the workstation its impressive image generation power. The next year Silicon Graphics released its first workstation, the IRIS 1400, and followed it in 1985 with the IRIS 2400, a workstation with a window manager. 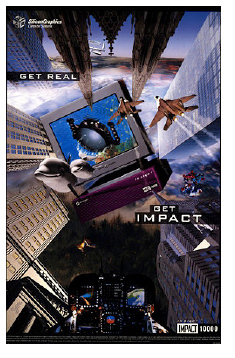 These early entries in the IRIS series targeted the middle range of the graphics workstations market – those selling for $45,000 to $100,000 – and accounted for over 50 percent of all 3-D graphics workstations sold by 1988. Silicon Graphics succeeded because it introduced a product that served cross-markets, from 3-D graphics simulations useful to mechanical engineers who wanted to assess their designs without having to build prototypes, to chemists who used 3-D modeling to study molecules. Such workstations as the IRIS series provided power at a relatively affordable price and major workstation manufacturers, including Hewlett-Packard, Apollo Computer, and Sun Microsystems, were slow to focus their energies on 3-D graphics, leaving Silicon Graphics without much direct competition. In 1987 it became the first computer company to make use of MIPS Computer Systems’ innovative reduced instruction-set chip, or RISC, when it incorporated RISC architecture into its new IRIS 4D/60 workstation. Within several years, most workstations would use RISCs. The company received a boost the next year when IBM agreed to buy Silicon Graphics’ IRIS graphics card for use in its own RS/6000 graphics workstations and to take out a license for the IRIS Graphics Library, helping to make the IRIS Graphics Library the industry standard. Also in 1988, Silicon Graphics introduced a new line of entry level graphics workstations, which it called Eclipse. The Eclipse was designed to bring 3-D graphics to people who had previously regarded IRIS workstations as unaffordable. Eclipse lacked the speed and processing power of more expensive machines, but initial versions sold for less than $20,000 – as little as one-fifth of the cost of higher-end machines. In 1991 the company released an even less expensive product line – the IRIS Indigo, a 3-D graphics workstation so compact that the company called it the first personal computer to use RISC architecture. The Indigo offered many features found on more expensive models, as well as digital audio and video processing capability, and the base model sold for less than $10,000. In 1991 the company granted a license to Microsoft for the IRIS Graphics Library. Microsoft intended to use the IRIS Graphics Library in its NT operating system for personal computers. 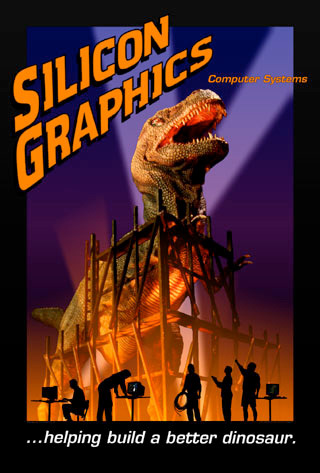 In 1993 Silicon Graphics and Industrial Light and Magic joined forces to create a high-tech entertainment special effects laboratory. The joint venture was called Joint Environment for Digital Imaging (JEDI) and grew out of the fact that Industrial Light and Magic had been using Silicon Graphics workstations since 1987. The cyborg featured in the film Terminator 2, the dinosaurs in Jurassic Park, special effects in The Hunt for Red October and The Abyss, and animation in Beauty and the Beast were all created on Silicon Graphics computers. For Industrial Light and Magic, the benefits were that digital manipulation of images cost about one-tenth as much as models and drawings, and, according to Lucas, would “change motion pictures from a photographic process to more of a painterly process,” enabling greater authorial control over a film’s appearance. For its part, Silicon Graphics hoped that alliance with an entertainment industry partner would help push the leading edge of its technological development forward. In 1995 Silicon Graphics teamed up with DreamWorks SKG – the entertainment entity formed by Steven Spielberg, Jeffrey Katzenberg, and David Geffen, and DreamWorks Digital Studio for the creation of animation, feature films, and other products. Silicon Graphics also acquired Alias Research and Wavefront Technologies for $500 million in 1995, which positioned Silicon Graphics in the software business. Alias specialized in 3-D animation software that was widely used in the entertainment industry and in industrial design. It had developed new ways to simulate wind, fire, skin, and other special effects, and it also had an animation tool used by Nintendo in its video games. WaveFront Technologies developed industrial visualization software. In April 1999 Silicon Graphics Inc. changed its name to SGI as part of a new worldwide corporate identity strategy that reflected the breadth and depth of the company’s products and services. The strategy included three sub-brands: SGI servers and workstations, Silicon Graphics visual workstations, and Cray supercomputers. At about the same time in 1982, Sun Microcomputers was founded. They also introduced a workstation that had an embedded frame buffer. The CG1, CG2 and CG3 boards were the boards used in the Sun 1, Sun 2 and Sun 3 workstations. (The Apollo workstation also provided the single user-dedicated frame buffer technology.) Sun later used an add-on accelerator board made by Trancept Systems for the Sun 3 and Sun 4 workstations. In the Spring of 1987 we introduced the TAAC-1 product for Sun Microsystems workstations. The TAAC-1 consisted of two large PC boards, one full of video RAM, the other full of a micro-programmed wide-instruction-word (200 bits) processor optimized for graphics and imaging operations. The TAAC-1 was plugged into and memory mapped onto the Sun’s VME bus. The Trancept board was intended to be replaced by the VX/VMX boards in 1990. The VX included one Intel i860 processor with a VRAM frame buffer, and the MVX added a board with 4 more i860’s (potentially up to 4 boards with 16 processors). Both SGI and Sun were facing fierce competition in the 3-D graphics and imaging markets from Apple Computer Inc., which was introducing QuickDraw 3D, and Microsoft Corporation, which had recently acquired SoftImage and its line of simulation software. In addition Steve Jobs, founder of Apple and NeXT, had recently purchased animation producer Pixar and teamed with Walt Disney Studios on Toy Story, a full-length animation film created entirely with computers. In 2006 SGI filed for Chapter 11 bankruptcy, and although they emerged from the reorganization that same year, they filed again in 2009. The once powerful workstation company sold all of its assets to Rackable Systems for just over $40M. Also in 2009, Sun and Oracle entered into an acquisition agreement, and in 2010 it was acquired by Oracle; their sprawling Menlo Park headquarters became the new home of Facebook in 2011. 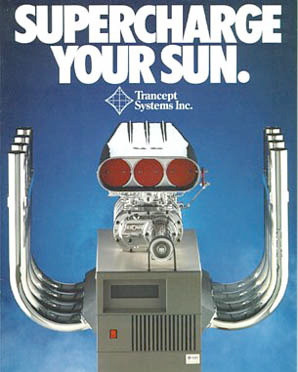 For a little Sun frame buffer and graphics processor history, click here. VizWorld.com published a blog series on the downfall of SGI titled What Led to the Fall of SGI? Computer Graphics and Computer Animation: A Retrospective Overview by Wayne E. Carlson is licensed under a Creative Commons Attribution-NonCommercial-NoDerivatives 4.0 International License, except where otherwise noted.